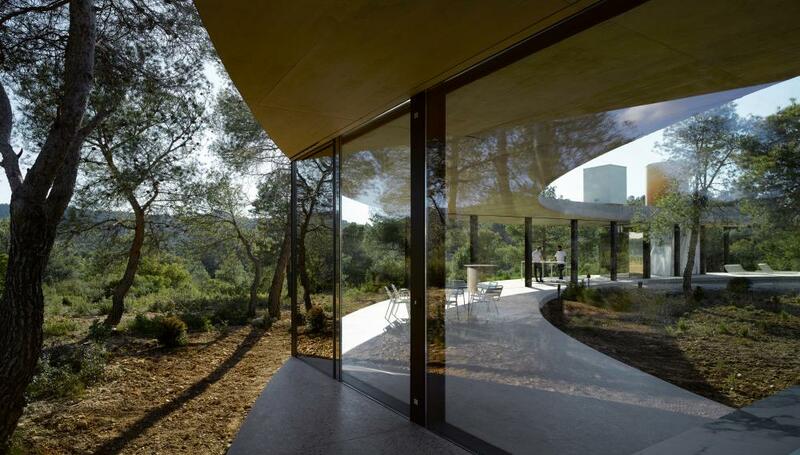 Within a narrow angle of vision you can see: shadows of leaves; the dusty soil and stubborn flora of this wooded part of Spain; light bouncing off water; the shaved and polished pebbles of a curving concrete floor; dark steel posts and beam; a curving concrete slab above; above that, a cylindrical water tank in the graded earth colours of a creme caramel; sky; the head and red tap of an external shower; a silvery shower curtain; strings of bare lightbulbs; a white steel pod containing an outdoor toilet; and a big stainless steel cupboard whose angled mirrored surfaces cause it to melt into greenness. Due to a fall in the ground, the trees behind show their foliage rather than their trunks. An elusive honeycomb pattern is set up by the moiré effect of the perforated steel wrapping of a freestanding sink unit. This dense assemblage of stimulations widens out into a larger structure, a perfect 45-metre-wide concrete circle inscribed with multiplying effects of transparencies and reflections. It’s like a wood, in that the substance (trees, building materials), without which you couldn’t call it a wood (or building), keeps dissolving into shadows, light and depth, without going away altogether. This – the use of materials, light and space to intensify experience – is what architecture should do. A lot of the time it doesn’t get the chance. 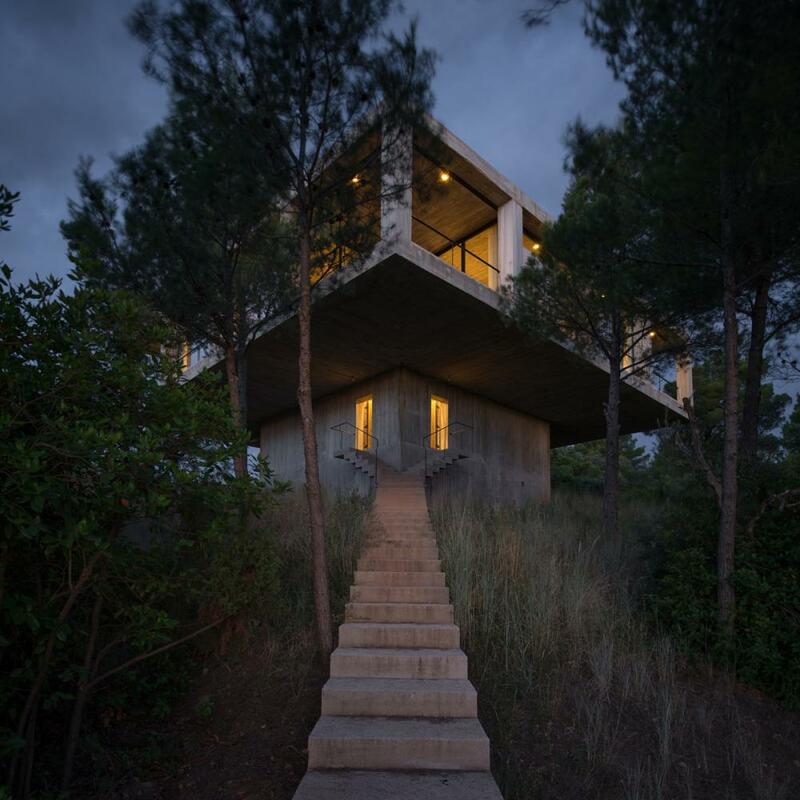 This fascinating structure is a holiday house, recently built in the wooded, mountainous district of Matarraña, in Aragon, just over the border from Catalonia. It is one of two so far completed in a development called Solo Houses, which is planned to include a total of 15 plus a hotel, each designed by a different architect. The project was invented by a Paris-based couple, Christian Bourdais, who formerly traded in antiques from south-east Asia, and Eva Albarran, a producer of cultural and artistic events. The idea is to build a collection of architecture as others might art, to make “a history of what is architecture at this moment in time”, to commission the best possible designs, to “follow architects as far as they will go”. The overall project is a bit like Alain de Botton’s Living Architecture programme of architect-designed holiday homes, except that Solo’s are all in the same 100-hectare location. It also resembles the Serpentine Galleries’ annual architecture pavilion, with the difference that these houses are permanent and habitable. Two of the architects recently favoured by the Serpentine, Smiljan Radić from Chile and Sou Fujimoto from Japan, are working for Solo, and Hans Ulrich Obrist, the Serpentine’s artistic director, is advising on a programme of artworks for the development. Indeed, this concept of the architectural collectible could be called “obristism” – eclectic, well informed, international, knowing, with preferences for the idiosyncratic but about-to-be-recognised, for the intellectually alive and the mildly decadent. Solo Houses’ choices are those of enthusiasts who know their field and know what they like. Bourdais says he wasn’t looking “for the fashionable architects that everyone knows”, but people of his own fortysomething generation who would think the same way that he does. “They were babies when we met,” he says, but in the six-year gestation of the project they have ascended some gradations of fame, including the Serpentine’s recognition of Radić and Fujimoto. For the location Bourdais spent six months touring Europe, looking at “amazing sites in which it was also permitted to build”. He settled on Aragon because its planning policies are more favourable to building in the countryside than Catalonia’s. The first house was by the Chilean couple Mauricio Pezo and Sofia von Ellrichshausen, who featured memorably in the Royal Academy’s Sensing Spaces exhibition of 2014. It is a concrete tower that spreads at the top, a right-angled mushroom that counters the usual intuition that, confronted with amazing views and amazing climate, openness is all. Inside the stalk you get dungeon-like darkness, water pipes glinting in the shadows, light coming mostly from viewing panels into the blue water of a pool. When you get to the top you find a square patio house in the sky, with the pool in the sheltered centre and an outer layer of rooms looking out in all directions. From here, finally, you get the view. 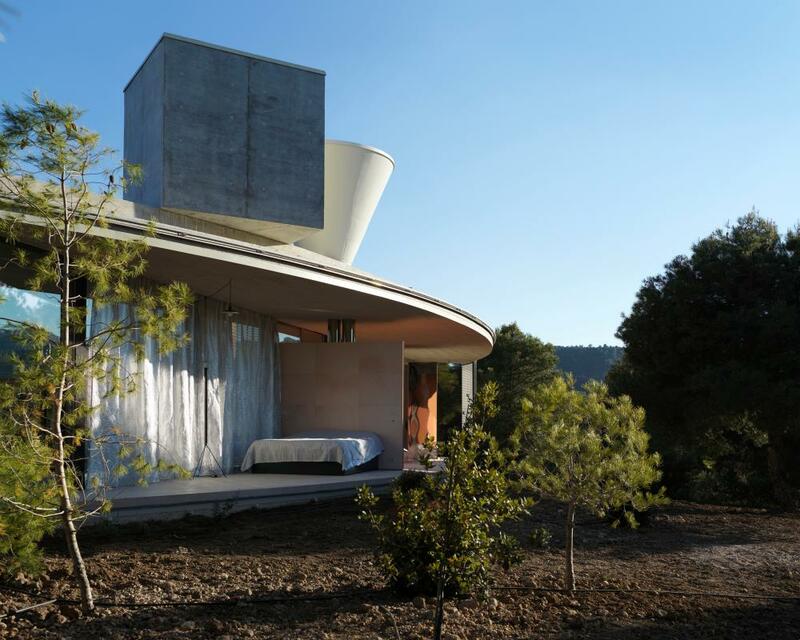 The second, circular house is by the Brussels practice Office Kersten Geers David Van Severen who, since they set up in 2002, have been building respect for their nuanced and subtly subversive work. They wanted, they say, to make their Solo House “the least like a house as possible” to “make contact in a light way with the landscape,” and to “somehow disappear”. This does not mean, for them, “camouflage”, nor making something woody that might have been assembled by goblins – you can’t miss that the building is there – but trying to “coincide” with nature. They use the machine-age materials – glass, steel and concrete – of Mies van der Rohe and Le Corbusier, together with more louche fabric: curtains and screens that filter the light, touches of marble, stainless steel that warps reflections like a fairground mirror. They draw on a modernist fascination with the sensual and illusory that was often ignored by official histories but was practised, for example, in houses, interiors and exhibition pavilions by Mies and the textile designer Lilly Reich in the late 1920s and early 30s. Geers and Van Severen also exploit a modernist love of blurring inside and out: the elements of the house are divided into three enclosures about the perimeter of the circle, a thin sliver containing a kitchen/dining/living space and two more containing beds and bathrooms. You have to go outside to get from one to another. It then turns out that the outer walls are actually sliding screens that can be shunted out of the way, to expose like a falling beach towel the naked interiors. Beds, baths and kitchen stand open to the horizon. The screens create, along with the shimmers and reflections, a zone of instability and transience that is given definition by the precision of the circle. Further contrast is provided above the roofline, where are placed blunt necessary objects such as solar panels, water tanks and heating and filtration devices, shaped into cylinders, cubes and cones. The two cylinders have been given the colours of earth and sky by the artist Pieter Vermeersch, but otherwise these objects are as solid and factual as the lower level is evanescent. In keeping with the pervasive desire to play with expectations, their placing inverts the architectural hierarchy that traditionally puts the celestial and dreamy above the basic and chthonic. You are free to wander outside the building into the woods, but somehow the circle casts such a spell that you are mostly happy to pad about inside it, savouring the solitude, mesmerised by the repetitions, correspondences and infinite variety of this horizontal, hedonic hamster wheel. The experiences of intimacy and vastness, of being alone in what is a sparsely populated landscape, are felt with more force inside the circle. Holiday colonies built in lightly touched nature are not, of course, always good news, but so far the Solo Houses add to their surroundings rather than detract from them. They are there but they don’t dominate. There are pitfalls too, in the obristist notion of building-as-collectible, as it tends to favour the statement over the liveable. This trap is also avoided, as for all its richness of materials and ideas the architecture knows when to stand back to allow you, as Geers puts it, “just to make your life”. The whole thing is rarefied and indulgent, of course, and it’s not going to solve any housing crises, but at the task it has set itself – of creating architecture that is as good as it can be – it succeeds. 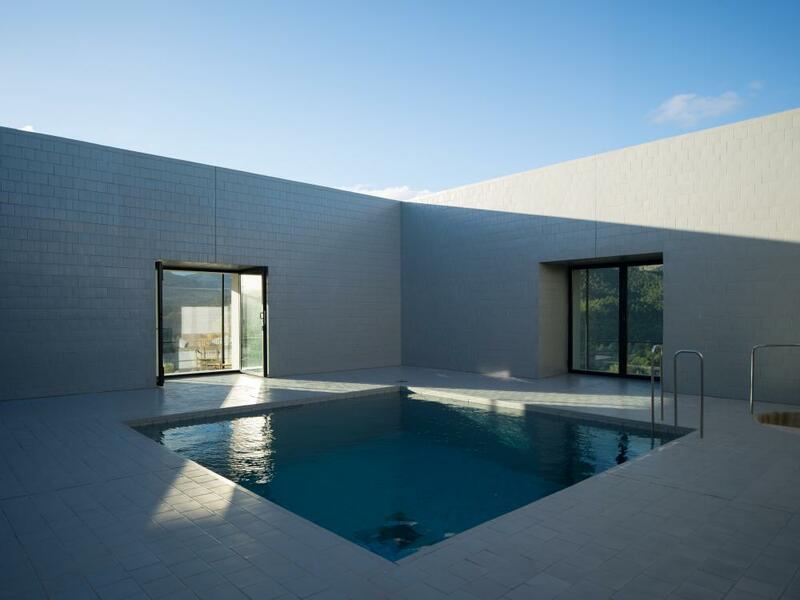 ‘Finally you get a view’: the pool on the top floor of the Pezo Von Ellrichshausen house.